The ML-B50CFP (Fixed Platform - 26" x 26") (Pic. 1)) is designed to transport boxes, cartons, etc. that are manually loaded on the platform and easily transported and unloaded on shelves, racking, trucks, etc. This model is also well suited for die and mold handling. The ML-B50CFF (Fixed Forks - 6"W x 26"L) is designed to lift heavy skids, baskets and other bottomless containers for easy transport. Particularly useful for maneuvering in tight or congested areas, these units combine power lift with easy to manage manual push operation. 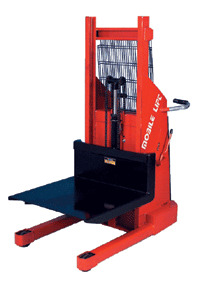 A safe ergonomic alternative to forklift trucks at a fraction of the cost, these Stackers are easy to use, need no special training to operate, and require a minimum of maintenance. Frame: Rugged heavy duty frame constructed of formed and welded steel for extra strength. Lifting Chains: Unique dual lifting chains are roller style, heavy duty steel exceeding a 6:1 safety factor. Hydraulic System: Durable cylinder features a chrome plated ram and a relief valve for overload protection. Battery: Features a heavy duty 12 volt, 125 amps/hour industrial strength battery. Charger: The built-in battery charger is a 10 amp Selenium rectifier with transformer, circuit breaker and overload protection. Plugs into any 110 volt outlet. Steering: Features two 5" Phenolic swivel casters for easy maneuverability in tight areas. Wheels: 4" diameter Phenolic load wheels with roller bearings are located in the straddle legs. Brake: Features a hand controlled floor lock brake that secures the unit in place. Capacity: 2000, 2500 abd 3000 lbs. Note: Please call ZORIN (888) 378-6525 for pricing.